"The Plating of the Penny 1840-1864"
This set of pages accesses an Index to the marvellous work by Mr. Harold W. Fisher, based on the measurement system devised by Roland Brown. This Index is taken from a searchable, full information database which I created while Mr. Harold Fisher was alive, and with his permission. 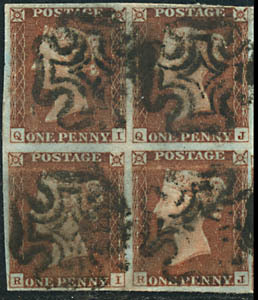 It contains an encoded version of all the relevant positional data for the five volumes of the The Plating of the Penny 1840-1864. No actual book data is available on these pages, only a search for possible matching plates. The Brown/Fisher books, although well out of print, may occasionally be found at auction. Most of the markings that can help separate the plates are also found in the Statham "Essential Guide". Recent acquisitions by members of the Missing Imprimatur Group on Yahoo are leading to filling in some of the missing measurements. The measurements given are classed as 'provisional', in that they come from three or more issued impressions and thus may vary slightly from the imprimatur due to under/over inking or wear. These 'provisionals' and corrections to the original data will have the Plate Number in the returned list marked with an asterisk. Those added data coming from less than three copies will have a tilde. The listings returned include any exact matches, the matches for the range you have selected and a list of those plates for which there is no data. For ease of working, you may 'print' the results. That will open a pop-up window with all the information for the example and may then be copied and pasted into any text editor. ONLY if you have considered all possible returned matches out to +/-4 should you begin to consider the example as a possible "Missing Imprimatur". Placement of this information on this public website does not confer any rights for reproduction, commercial use or posting on another web site. All Photographs, Graphics and Text on these pages are Copyrighted ©. Items not owned by the author(s) are used with permission. Graphics and scans are copyrighted in the year produced. All Rights Reserved. For more information email .